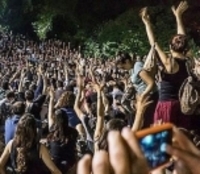 Ankara Chief Public Prosecutor's Office has issued an indictment against 120 people as part of an investigation launched into Gezi Park protests. Sending the indictment to the court, the Prosecutor's Office has charged the suspects with "opposition to the Law on Meetings and Demonstrations" and "resisting to prevent public officers from fulfilling their duties." As reported by the state-run Anadolu Agency, Press Offences Investigation Bureau of the Ankara Chief Public Prosecutor's Office has started working to eliminate the deficiencies in the files of the investigations launched into the Gezi Park protests in the capital city of Ankara. The Public Prosecutor appointed to conduct the investigations into the protests has filed five separate lawsuits against 120 suspects on charges of "opposition to the Law on Meetings and Demonstrations" and "resisting to prevent public officers from fulfilling their duties." Feminist Night March in Beyoğlu at 7:30 P.M. Comments Off on Feminist Night March in Beyoğlu at 7:30 P.M.